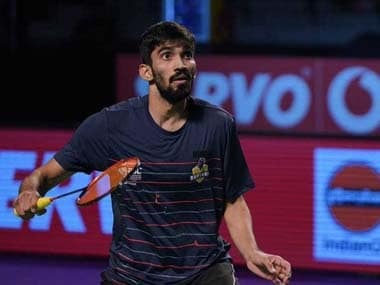 Taipei: Defending champion Sourabh Verma will have his task cut out when he begins his campaign at the $200,000 Chinese Taipei Grand Prix Gold badminton tournament at Taipei on Tuesday. The 24-year-old from Madhya Pradesh has not been in the best of form in the run-up to the tournament. He has played a number of three-game thrillers but have not been able to seal the opportunity after doing all the hard work. This week his mental fortitude will be tested when the fourth seeded Indian begins his campaign against Malaysia's Lee Zii Jia. Among others in men's singles, Rahul Yadav Chittaboina will be up against En Chia Chang, while Siril Verma will face local shuttler Wei Chi Liu, and Abhishek Yelegar will take on Malaysia's Yu Ming Adam Lau. Mumbai's Harsheel Dani will face off Hong Kong's Lee Chak Wai, Kartikey Gulshan Kumar will meet local player Shih Kuei Chun and Siddharath Thakur will square off against Thailand's Suppanyu Avihingsanon. Hemanth M Gowda will meet 10th seeded local hope Hsueh Hsuan Yi, while Harshit Aggarwal will take on a qualifier. In women's singles, Sai Uttejitha Rao Chukka will face Korea's Na Yeong Kim and Sri Krishna Priya Kudaravalli will clash with fourth seeded local player Chiang Mei Hui. Tanvi Lad will fight it out against Chinese Taipei's Hung Yi-Ting.